Hancock County is a county located in the state of Iowa. Based on the 2010 census, the population was 11,341. The county was created on January 15, 1851. The county seat is Garner. Hancock county is named in honor of John Hancock, a leader of the Continental Congress during the American Revolution and signer of the Declaration of Independence. Hancock county is named for John Hancock, the American patriot and signer of the Declaration of Independence. Hancock County was established in 1851. It was named for John Hancock (president of the Continental Congress) and formed by an election held on June 28, 1858. Only two townships were set up following the election, Avery and Madison. The first site for county business was in Amsterdam. A courthouse was planned and bid on, and $2,000 was let to B. A. Hill for the construction of the building. One month later, however, the administration of the county was changed, the contract was voided by the new administration, and no courthouse was built. County business was held in the Amsterdam school until November 1865, when it became apparent that the county would need a courthouse. Land was donated by the Seymour family of New York and was designated as the county seat. The site was named Concord. Two small frame buildings were then constructed for the county offices on the Courthouse Square at a cost of $2,580. Officers of the county were notified on December 4, 1865 that suitable offices were ready. Interest in a brick courthouse began to grow, and in 1867 a motion for the construction of a brick building was presented by the Board of Supervisors, defeated in an election; another petition was resubmitted and again sent to the voters - all in the span of just two months. On the second election, the motion was passed by the voters, and construction of the new courthouse began in 1868. Grover R. Maben was in charge of construction and he used brick and timber, both of which came from his farm. The bricks were fired at his farm and the timber cut from his grove and shipped to Waterloo for final cutting. The building cost $10,000 and was ready for occupation in 1869. The county seat remained in Concord for nearly 30 years, to the disgruntlement of some Hancock residents. Then, in 1898, the highly organized residents of Britt launched a campaign for the relocation of the county seat. They had plans drawn up, pictures of the proposed building, land ready for construction, and, more importantly, $25,000. The residents of Garner countered this action by annexing Concord (just one mile south of Garner) and contributing $30,000 for the purchase of a land and construction cost. After many legal battles and verbal exchanges, construction began in Garner. 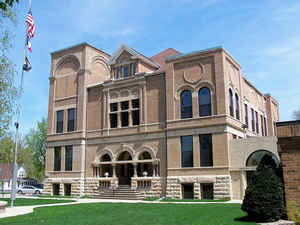 Architect F. W. Kinney designed the building, and construction was done by Gross Construction of La Crosse, Wisc. The new courthouse was turned over to the county on November 15, 1899. In the meantime, the county officers remained in Concord, and Britt did not concede defeat. However, at a November 3, 1903 election, and by a vote of 2,057 for and 568 against, the Board of Supervisors finally declared Garner to be the county seat and gave the county officers 30 days to move to the Garner courthouse. Garner has been the home of county offices since that time. As reported by the Census Bureau, the county has a total area of 573 square miles (1,480 km2), of which 571 square miles (1,480 km2) is land and 2.0 square miles (5.2 km2) (0.4%) is water. Hancock county is located in north Iowa. Crystal Lake is located in this county.